Do you offer Gift Vouchers at SEA LIFE Kelly Tarlton's? What is the SEA LIFE Kelly Tarlton's + Explorer Bus + Return Davenport Ferry Combo deal? What is the Behind the Scenes Tour Ticket? What is the Parent + Child Ticket? Our Online Saver discounts vary from 5% to 20% on single tickets and even more on family tickets, depending on the date and/or time of your visit. All price savings messages shown on this website are comparisons to the standard walk-up prices, which are charged at all times on arrival at the ticketing desk. TIP: The largest online discounts are most often available in off peak periods and also at certain times in peak periods. Peak periods are weekends, school holidays and public holidays. You ALWAYS save when you book your tickets online! Please be aware Online tickets are not valid for entry with any other promotion, discount or special offer unless explicitly specified. How long does it take to go around SEA LIFE Kelly Tarlton's? 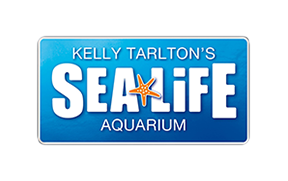 What are SEA LIFE Kelly Tarlton's opening times?